The University of Florida Center for Safety, Simulation & Advanced Learning Technologies (CSSALT) recently posted videos (see links below) of their 3 latest simulators for teaching, learning, practicing and de-briefing procedures such as access to critical veins and structures of the human body without or with the use of ultrasound imaging (assistance, guidance). So what does that mean exactly? Well, have you ever had a clinician require multiple attempts to insert a needle into your vein as part of receiving an IV and from the way it’s going, you wished the medical professional had just a bit more “hands on training”? Saving you from being part of a novice’s “learning curve” is what these advanced simulators developed by CSSALT can facilitate by providing a potentially more efficacious and considerate alternative for trainees (novices and experts) to obtain valuable hands-on experiential learning. The traditional method of learning central venous access, thoracic paravertebral blocks and thoracic epidurals, is by performing them, initially under supervision, on a real person. As you can imagine, there are no “do-over’s” with actual patients. Simulators allow trainees to play back previous attempts, re-examine mistakes, and refine their techniques before performing procedures on actual patients. 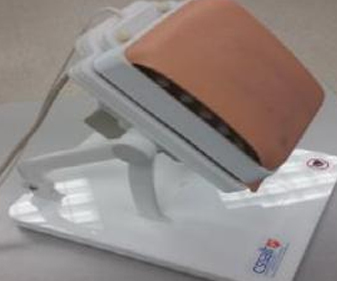 Ultimately, the CSSALT simulators are being developed for the purpose of patient safety and quality of care. 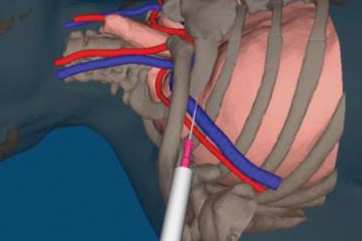 The “mixed reality” design mixes virtual components (3D visualization of bones, e.g., in the photo with a syringe) and the corresponding physical parts (e.g., 3D-printed bones). Needles, ultrasound probes and other tracked tools are tracked with “six degrees of freedom” (6DOF) magnetic sensors. The system design is modular so that the original or third-party developers can rapidly re-purpose most of the hardware and software for other procedures and their relevant anatomies. 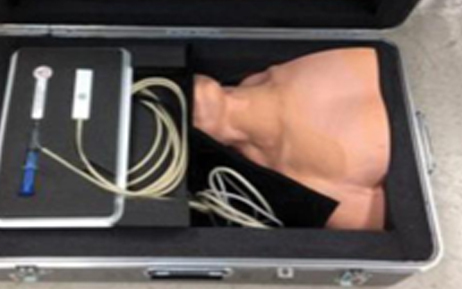 The modular set of simulators makes it possible to navigate the relevant anatomy using 2D gray scale cross-sectional views that a simulated, tracked, handheld ultrasound probe provides, while advancing a tracked, hand-steered needle. The opportunity for repeated deliberate practice in a lower stress environment without risk to patients should result in added confidence and precision when performing these procedures on actual patients. The bony structure is developed by a CT scan of relevant areas of the human body that is segmented into a CAD file. From there, Synergeering was asked to create the 3D-printed physical model with RapidNylon®. The 3D prints were used as the internal bony structure representing, for example, the sternum and spine (see above), encased in ballistic gel and overlaid with a puncturable skin-like material for these incredibly unique simulators.